Plans to expand Geevor tin mine in Cornwall as a tourist attraction have been boosted by a pledge of £2.5m from the Heritage Lottery Fund. Another £1.3m has been committed by local councils and Objective One. 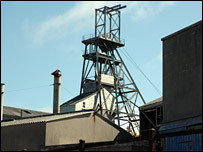 If final bids are approved the works on the site, a proposed Cornish Mining World Heritage Site, will be completed by Easter 2008. After the mine ceased working in 1992, the county council bought the site and opened it to the public. Adam Paynter, of the county council, said: "This is great news for Cornwall. "There are at present 36,000 visitors a year to Geevor and the project aims to increase this to around 65,000 visitors a year." Nerys Watts, Heritage Lottery Fund Manager in the South West added: "This project pushed all the buttons for us. "It will conserve, enhance and open up an important heritage site, bringing the story of Cornwall's mining past to life for local people and visitors alike."